When you logon to a Windows Small Business Server 2008 or 2011 the SBS Console is started automatically. If you don’t want the SBS Console to start automatic you can prevent this by changing the following Task schedule. 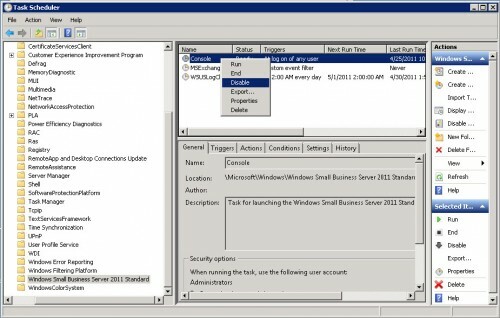 Open Administrative Tools – Task Scheduler, go to Task Scheduler Library – Microsoft – Windows – Windows Small Business Server 2008 or 2011 Standard. Right click Console task in the right windows and choose disable. Next time you logon the SBS Console will not be started at logon. Posted in Blog, SBS 2008, SBS 2011 by ronnypot at April 30th, 2011. Thanks for finding this. I don’t know why Microsoft didn’t bother to include a “Do Not Show on Startup” checkbox like they do on Server 2008. Thanks also from me. It´s boring to see everyday this useless program, even I want to do small things in this machine. +1. Next server upgrade they’ll need to invent yet a 4th way to launch applications at startup as we all learn to go to the task scheduler now to shut all the crap off that everyone adds to the startup routine. Deleted the scheduled task many months ago after finding this post. However, the console still opens upon login. Sorry never seen that before, maybe it has been restored with an update or something, did you check if the scheduled task is still gone?